Your device lets you use a microSD or microSDHC card to expand memory space and accepts memory cards with maximum capacity of 128 GB. This secure digital card lets you exchange pictures, music, and data with SD compatible devices. The provided information refers to the devices sold in Canada. Screens and settings available may vary depending on your Canadian wireless service provider and your software version. 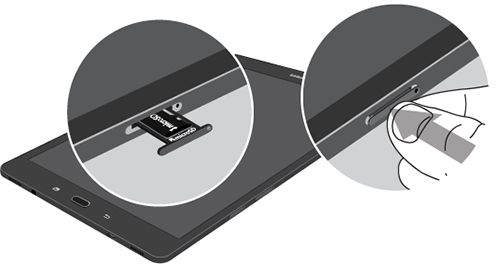 The microSD card slot is located on the right hand side, while looking at the screen. 1 Insert the ejector tool into the hole in the microSD card tray on the side of your device, and gently press the tool until the tray pops out. A paperclip or a toothpick make a good alternative to the ejector tool, if you lost it. 2 Place the microSD card into the tray, and insert the tray back into the device. Place the SD card label side up. When you insert a memory card, it is automatically mounted (connected to the device) and prepared for use. However, should you unmount the card without removing it from the device, you will need to mount it before it can be accessed. 1 From the Home screen, touch Apps > Settings > Storage. 2 Scroll to and touch Mount SD card. 3 Touch OK to mount the SD card. To prevent damage to information stored on the memory card, always unmount the card before removing it from the device. 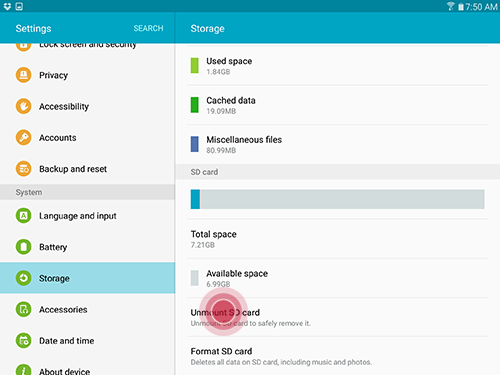 2 Scroll to and touch Unmount SD card. 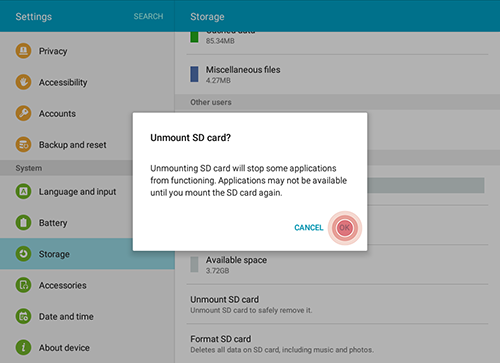 3 Touch OK to unmount SD card. 4 Insert the ejector tool into the hole in the microSD card tray on the side of your device, and gently press the tool until the tray pops out. 5 Remove the microSD card from the tray and insert the microSD card tray back into the device. What can I do if I lost the ejector tool? If you lost the ejector tool, don’t panic! It is easy to replace it with a very common object: a paper clip. 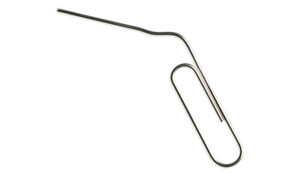 Unfold one of the end of the paperclip (as shown above) and use it as an ejector tool. As you can see, it is a very simple DIY! 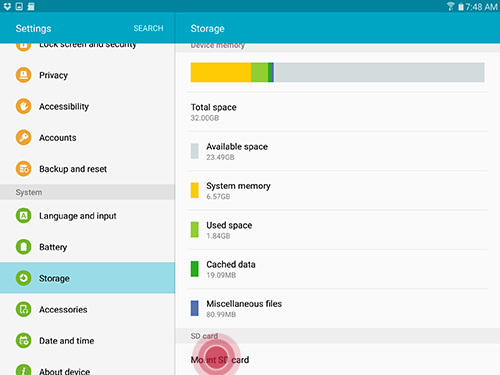 Galaxy Tab S2: How do I format the microSD card on my Samsung Galaxy Tab S2?